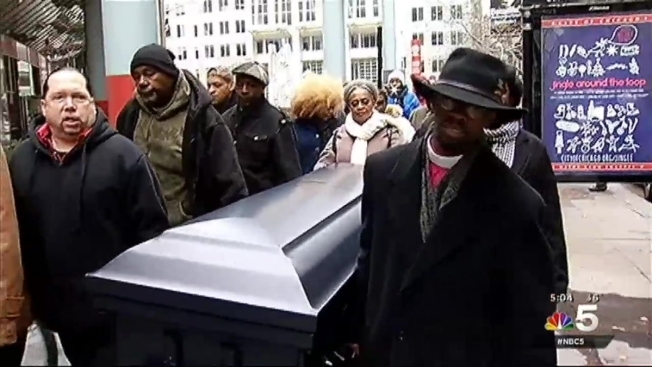 Dozens of people marched around City Hall Saturday to raise attention to the fatal police shooting of 17-year-old Laquan McDonald and to the murder of 9-year-old Tyshawn Lee. Marchers also carried a casket and chanted "16 shots and a cover up," referring to the number of times Chicago Police officer Jason Van Dyke shot McDonald. "This is a symbolic measure we're taking today to make sure that everybody at City Hall understands that Laquan McDonald's blood is spilling all over City Hall," said community activist Tio Hardiman. The afternoon march was one of several rallies planned throughout Chicago on Saturday. Rev. Jesse Jackson, who led a large protest on Black Friday along the Mag Mile, scheduled another event at 11:30 a.m. at the Rainbow PUSH Coalition headquarters at 930 E. 50th St. He threatened to escalate protests unless elected leaders stepped aside. Another peace and justice march started at noon on the city’s Southeast side at the Calvary Community Complex at 8108 S. Chicago Ave. The Chicago Alliance also planned at march for justice at 63rd and Cottage Grove at 3:00 p.m.